My name is Margaret Blank, and I live in the Hamlet of Mirror, Alberta, located about 40 minutes NE of Red Deer and equidistant between the City of Lacombe and the Town of Stettler. Though I was born in the small town of Huntingdon, Quebec, I moved to Calgary in the fall of 1976, with my husband of one year, Howard, who was from Vancouver. We lived in the NW of that city for all of our married life, and it was a wonderful place to raise our two children. However, Type 1 Diabetes took Howard’s life in August 2006, and soon I was homesick for the countryside in which I’d grown up. With a daughter in Edmonton and a son in Lethbridge, I knew I couldn’t move ‘back East’. What a delight to find the rolling hills and proximity to Buffalo Lake that I have in Mirror, where every street ends in trees. 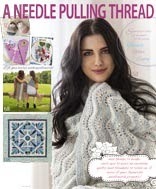 I learned to knit about age 8; cross-stitch, embroidery and garment sewing soon followed. 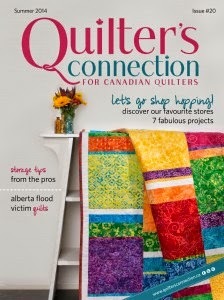 It was only in my forties that two girlfriends persuaded me to try quilting. They figured that slicing strips would be a good way to battle the stresses in my life, and they were right! That was about 1996. 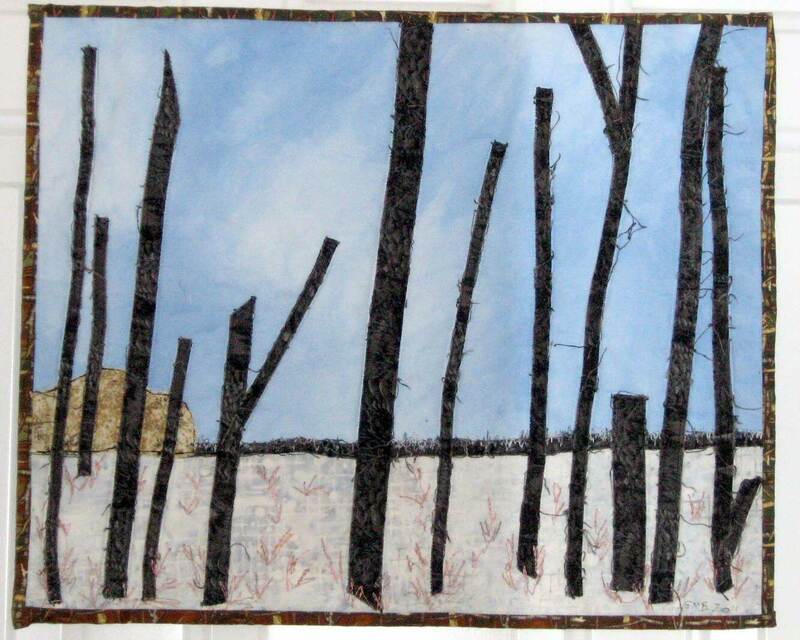 A few years later, when I saw my first exhibit of art quilts, I was gobsmacked. I just knew I had to try it! 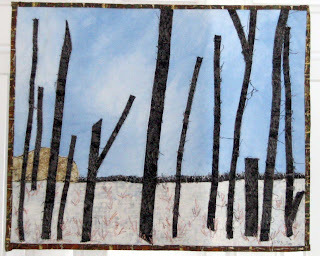 I have been studying textiles as an art medium since 2000 or so; my first instructor was Saskatchewan’s Anna Hergert (http://annahergert.wordpress.com/), who was living in Calgary at the time. 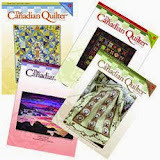 Currently I am working on Module 6 of eight in the City and Guilds of London Level 2 Certificate program, Creative Techniques: Quilting. 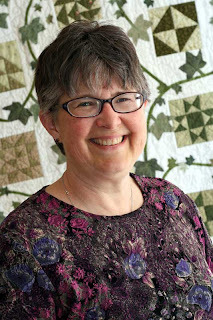 I am so blessed to have another amazing teacher: Linda Kemshall of Design Matters (http://www.lindakemshall.com/). In April 2011 I had my first quasi-solo exhibit: a booth of my artwork juried into the Annual Lacombe Art Show and Sale. As a result of the show, I sold a couple of my larger pieces, and one of my art cards (framed). This year, because of my studies, I’ve decided to enter only three framed pieces into the “Gallery” portion of the show. It runs this weekend (April 20-22) at the Lacombe Memorial Centre, if you’re in the area! I’m delighted to have had my work juried in for a second year, and to have my daughter’s photographs, on stretched canvas, in the Gallery this year as well. I’ve been a member of SAQA (Studio Art Quilt Associates) for several years now, and have been part of its Visioning Project for almost three years. This has enabled me to focus on what I want to do with my artwork, and has given me confidence to enter competitions and shows. Currently I have a piece with the SAQA Trunk Show, “This is a Quilt!” that is touring Canada and will be part of an exhibit in Taiwan later this spring through December. I also have a piece in the Focus on Fibre Arts Biennial Juried Show, opening in Edmonton on May 3, and one in the SAQA Western Canada Regional Trunk Show, opening at the Central Alberta Quilt Guild Show in Red Deer in June. I turn 60 in September. Given my long years of work and parenting, caring for my aging mother and my ailing husband, being responsible and ‘in charge’ all the time, I’ve chosen to pace myself and not get caught up in the drive for artistic success. My goals right now include finishing my City and Guilds Level 2 certificate, preparing for a full booth exhibit in Lacombe next spring, and enjoying the process of creativity. My biggest dream for myself would be to live long enough to use up my three stashes: fabric, fibre and floss! I’ve been blogging since February 2003 – believe it or not! 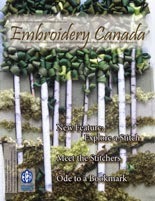 – and you can find me on the Web at www.margaretblank.com : Margaret Blank, Textile Artist. Please check the tab, “3F Creations” for more examples of my work. You can also find me on Facebook as https://www.facebook.com/MarginMirror -- and I have a “3F” page there too. 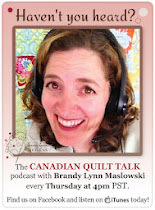 It’s been an honour to be a featured blogger on The Needle & Thread Network, and I look forward to “seeing” you in cyberspace!